That final exhortation, Praise him, forms the essence of Gerard Manley Hopkins' vocation as a poet. Now enshrined in the Pantheon of Great Writers (the above selection, “Pied Beauty,” is frequently included in anthologies such as 100 Best-Loved Poems), Hopkins had no reputation as a poet in his own lifetime outside an inner circle of family and friends. He was a Jesuit priest, first and foremost, so fervently dedicated to his vocation that his love and talent for poetry could seem to him, at times, like a betrayal. He was a small, pale, intelligent man beloved for his wit and eccentricities. He had taken an impressive double first at Oxford in Classics, an honor that might have led to a sterling academic career, but his conversion to Catholicism, inspired and encouraged by the famous English convert, John Henry Newman, came at a time when 'crossing the Tiber' was tantamount to treason. Exiles is a novel filled with “the fell of dark, not day,” a beautiful and exacting account of mankind's fallen state – exiles from Eden, from Heaven, from God. It is the latest from much-lauded Catholic novelist, Ron Hansen, whose 1991 novel, Mariette in Ecstasy, is one of the masterpieces of Catholic fiction in the 20th century. Mariette proved that a Catholic novel could earn praise from the secular press so long as it was indisputably brilliant and kept its Catholicism at a polite temporal distance – say, a hundred years ago. The historical element helps critics account for the deeply-felt faith of Hansen's protagonists as an anthropological curiosity rather than a spiritual reality. Nonetheless, Hopkins maintained an unofficial vow of poetic silence for many years after his ordination until he came across an article about a group of five German nuns who had perished in a recent shipwreck. They were on board the steamship Deutschland, bound for America via England, when the ship foundered somewhere near the mouth of the Thames during an unrelenting storm. And so he does. The result is the “Wreck of the Deutschland,” one of the poet's finest works. On the surface, Exiles is about the poem's genesis in the shipwreck story, and Hopkins' composition of the poem during a stretch at an idyllic Welsh seminary. Hansen flits back-and-forth between Hopkins and the five nuns, who are fleeing the oppressively anti-Catholic regime of Otto Von Bismarck. The two narrative braids coil tighter and tighter as the story progresses, forming a double-helix shaped meditation on faith, suffering, and catharsis through artistic expression. Shot through the story is the sense that life is suffering, a “vale of tears” only passable in the company of Christ. Strangely, the seminarian-set sequences featuring Hopkins are more dramatic than those featuring the stormswept nuns. In a novel, as opposed to a film, the interior drama of a man struggling with self-doubt and inner-anguish can be more compelling than the exterior drama of howling winds and massive swells. Because Hansen can focus so narrowly on his poet-protagonist, Hopkins comes alive as a sensitive, intelligent, sometimes silly young artist, ardent in his faith, though racked by scruples and low-ebbing confidence. Hansen is at home in the consciousness of a struggling writer, a poet fighting not only magazine rejections, but the gnawing sense that poetry itself is an unforgivable license, maybe even licentious. Most Catholic artists ask themselves the same thing. Hansen dramatizes the suffering of sensitive souls attuned to Christ's passion. In Mariette in Ecstasy, Mariette's ecstasy in Christ's suffering was almost sensual. She wanted to experience his suffering in herself, in her own flesh-and-blood, by scalding her hands and scarring her body. Hopkins' ecstasy – which might also be called heightened sensitivity – is artistic, finding voice in poetry rich with delight in 'dappled things' -- the natural world that is God's canvas, dotted everywhere with symbols and signs. Hansen is not only sensitive to the beauty of nature, but also to nature's sublime power. The eponymous story from his short-story collection, Nebraska, documented the horrifying effects of a blizzard in the Midwestern state. Exiles offers an equally unblinking account of a shipwreck in the Thames: cold, dark, hopeless. The five Franciscan nuns, each called to Christ in different ways from different backgrounds, seem senseless victims, chewed-up in the maw of wrathful nature, red in tooth and claw. To the shrouds they took, -- they shook in the hurling and horrible airs. Hansen uses the word instress to reference Hopkins' innovative meter, sprung rhythm, wherein a poem scans based on accents and stresses, emphasizing the sound of the words through assonance, alliteration, and internal rhymes. This isn't just technical jargon, but a way of writing that was truly original, groundbreaking. So much so, in fact, that Hopkins' truncated poetic career confirmed Christ's truism: a prophet is never accepted in his own country. When Hopkins submits “The Wreck of the Deutschland” to the journal, The Month, “the subeditor's opinion was that the 35 esoteric stanzas were hardly readable and had only managed to give him a headache,” an opinion apparently shared by many, since Hopkins' poetry would only see daylight when his friend, the poet-laureate of England (now generally forgotten), grudgingly published the poems posthumously. Hopkins understood, as he wrote to a fellow poet, that “The only just judge, the only literary critic, is Christ, who prizes, is proud of, and admires, more than any man, more than the receive himself can, the gifts of his own making.” Poetry is not simply expression, commemoration, or wordplay; it is a holy act, a sacrament, a means of worship. Christ is the only audience. Hopkins sought-for and found God in the texture of an oak tree, in the rhythm of water, and in the sanskrit of splintered ice. He looked for God as his own life shipwrecked on the shores of Dublin. He was a perennial exile. As a poet, he was exiled from the established literary community. As a Catholic, an exile from Anglican Oxford. As an educated Englishman, an exile in the rough-and-tumble Dublin backwater. And as a Jesuit, a member of a religious order long accustomed to exile. In this sentence the essential theme of the book emerges. We're all exiles, roaming confused and crippled in a world that seems bereft of faith and hope, an indiscriminately cruel place where five faithful nuns die in a hellish shipwreck, where a brilliant poet-scholar languishes forgotten in a crumbling college. Yet in suffering there is solace in the fact that God's will isn't capricious. The five nuns chose their vocations and acted in the service of Christ to the very end, bestowing self-giving love on each other and their fellow passengers even as 'hope had mourning on.' Hopkins, likewise, served Christ in his vocation as a priest, accepting each desultory teaching post like a private obeying the command of a superior officer. Unlike young poets today who feel entitled to express their innermost selves to an adulatory audience, Hopkins' poetry was a celebration of God, not himself, and his audience was Christ. 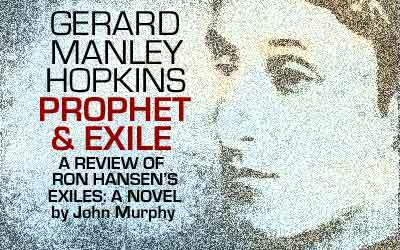 An earthly exile, Hopkins was going to his true home. I attended a Jesuit University in the early 40’s and was introduced to Gerald Manley Hopkins. My background is science and I was not a particular fan of poetry, but I loved Hopkins. Your article was wonderful. Pied Beauty and God’s Grandeur are particular favorites. My truly favorite is, O Deus Ego Amo Te; based on a prayer of St Francis Xavier. I use it sometimes as my prayer.